The Salvador Carnival is by far the biggest street party in the world. Every year, around 2 million people participate on the Salvador Carnival Parades. During six consecutive days, from 5pm to 5am, dozens of Bands make a parade along the streets, playing on big trucks (called Trios). Usually one or more Trios and Artists form a “Bloco”. The largest street carnival on Earth is held in Salvador Bahia, the `Land of Happiness` and gateway to the tropical north east coast of Brazil. The trios move from Campo Grande, by the Avenida Sete de Setembro to Praça Castro Alves. From there they turn around and make their way back to Campo Grande by Rua Carlos Gomes, parallel to Avenida Sete. The trios start at the Farol da Barra (the light tower) and go along the ocean until Ondina. The course takes about three hours. Nowadays there is a tendency for the bigger names to play on this parade. t has been added in the last years No trios here, rather a lot of old-time marching bands. This Circuit, takes place in the Historical City of Pelourinho and can be enjoyed for free and here and is where you will enjoy the cultural essence of the great historic City of Salvador Bahia.. It is quieter and less jam packed than the Barra and Campo Grande circuits. The cobbled streets of the historical center of Pelourinho host old time Carnival with bands performing on stage, children in costumes, last minute abadá shopping. This is where children’s groups and traditional groups parade. Because of the street size there are no vehicles in this part of town, lending itself to a calmer environment filled with more youngsters and elderly than elsewhere in the city. It also has Salvador’s highest concentration of cultural institutions, churches, museums and restaurants. Camarote – You can watch the Salvador Carnival from a cabin, or tribune, called camarote, located along the avenues. They offer drinks, food, massage, Disco and a dj dancing ambient. Tickets cost between one and five hundreds brazilian reais per day. Pipoca – You can simply dance on the streets with the crowd for free, called “Pipoca” (means popcorn) a funny way to describe how a jumping crowd looks like when seen from a distance. Surrounding the truck, there is a big rope carried by hundreds of security guards. This structure is organized, sold privately and called “bloco”. Each Bloco sells a different T-shirt called “Abadá”. This T-shirt is your entrance ticket and allows you to get inside the rope area. 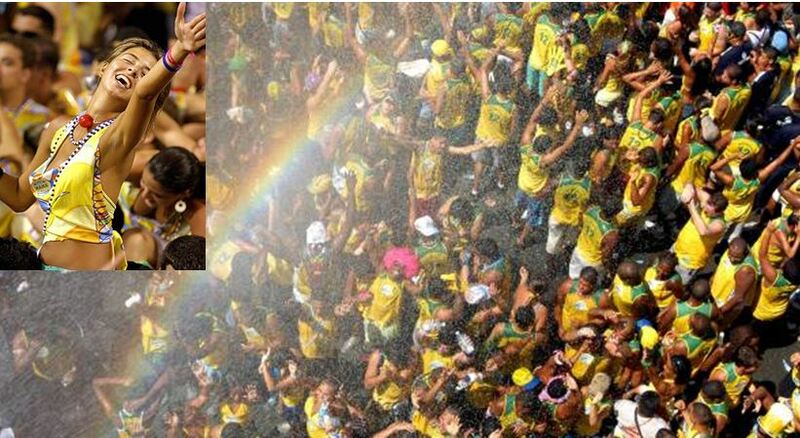 The biggest Blocos, like Camaleão, have over four thousand people, dancing, drinking, kissing and having fun during Salvador Carnival. The people who aren’t in blocos, and therefore are outside of the rope areas around the trios, are called “Pipoca”. Inside the rope the security is good and the situation is reasonably organized, what cannot be said about “Pipoca”. You don´t want to miss anything, but you prefer to have a mix of a regular party and the street Carnival itself? In this case you will go to a Camarote, a specially designed veranda with air-conditioning, built at a higher street level that allows you to see all of the blocos moving along the street. You can see everybody dancing down below, see and hear the singers and feel as if you were there with them. They are combination of nightclubs and VIP boxes that greatly reduce the stress of hanging with the largest people’s party. Camarotes may also have a beauty shop to help you look even more charming and attractive. Special “treats” are also offered like a quick massage if you get too tired, ribbons and buttons to decorate your T-shirt, etc.